Walsh, a new community under construction on 7,200 acres of former ranch land near Fort Worth, Texas, will one day contain 15,000 homes.To sell prospective home buyers on the development before it is fully built, Republic Property Group is leaning on technology.A high-speed fiber network will be installed alongside the traditional utilities, giving residents up to 10 GB internet speeds. Walsh will maintain its own private network, with residents paying for their internet access through home owner’s association dues instead of an ISP. If that doesn’t persuade you to throw down some earnest money on a home at Walsh, perhaps the community village will. In addition to day care, a lagoon-style pool for leisure, a lap pool for fitness, and a co-working space for remote office workers, Walsh will host a maker space for tinkerers, complete with robotics kits and 3D printers. All of this sounds great, but some things have to be seen to be believed. But, when a tech-friendly community isn’t yet built, what better way to show it off than augmented reality? 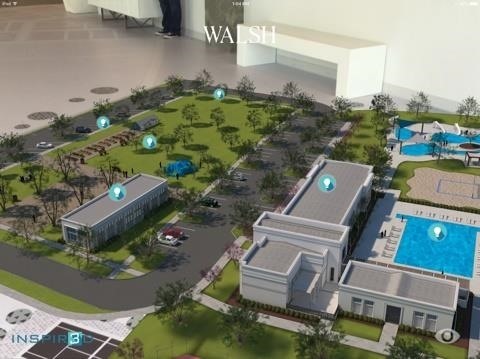 At Walsh, we recognized the need to start sharing the neighborhood’s story far before construction of model homes or community amenities would be complete. Given the demand for quality neighborhoods in excellent school districts in North Texas, we also wanted to stand out. 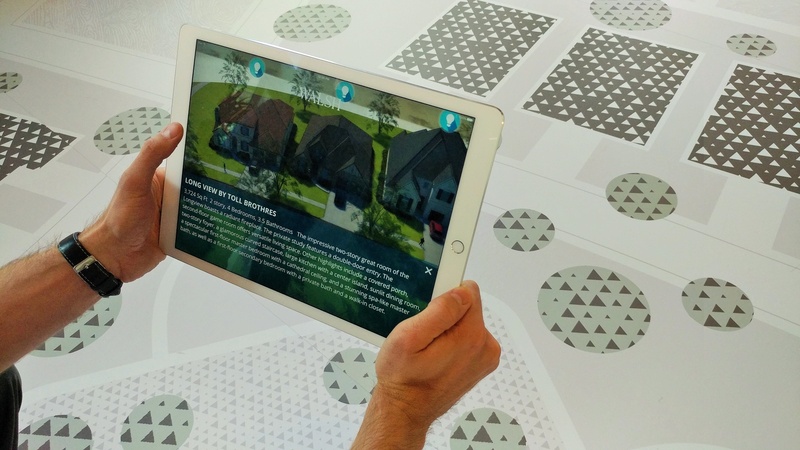 Augmented reality presented a way to make the research and sales processes more interactive for potential residents, and helps reinforce our vision of creating a modern and tech-forward community for Fort Worth. So, in April, Republic opened a pop-up storefront in downtown Fort Worth, about 12 minutes east of the development site. The floor space is mostly open, save for a desk in the back. 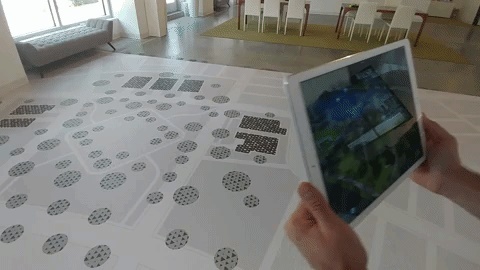 Covering much of the floor space is a vinyl map that serves as the marker for the augmented reality experience. The map displays several model homes on one end and the community village on the other. Visitors are able to walk visitors around the floor plan and, through the screen of an iPad Pro, see the homes and community center. 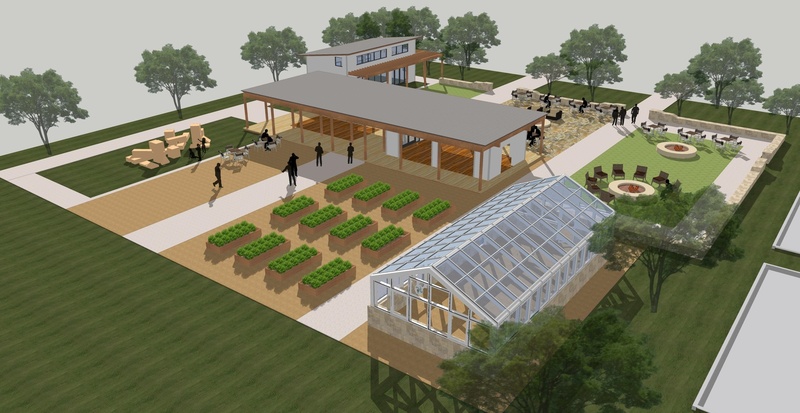 “The other thing that we liked about using technology to showcase the community and immerse people in what this space was going to look like physically is that it made a statement without directly pointing to a tech-heavy focus,” said Michael Voll, CEO at Frog. Through the learning experience and discovering and learning more about the community, we leveraged the next-generation technology to showcase people the art of the possible and how technology can enhance lifestyles. So, instead of just talking the talk of saying ‘we’re delivering really fast internet and cool technology, we wanted to show people in a meaningful way and meaningful use cases how technology can make a difference. 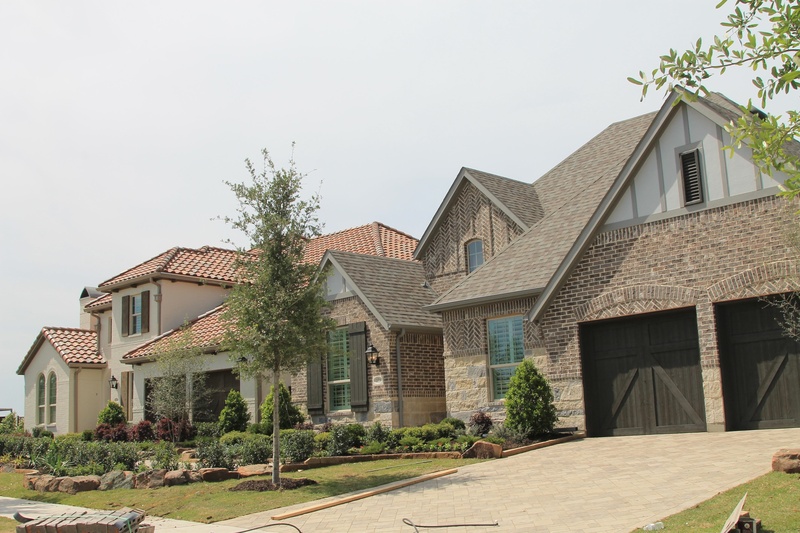 While nine model homes have now been constructed on site (with the first household set to move in after July 4), the AR-equipped leasing center still gives Republic a strong selling tool. The project has even gained converts with the local business community, as the Fort Worth Convention Center is talking to Frog about using AR to showcase designs for an upcoming construction project. 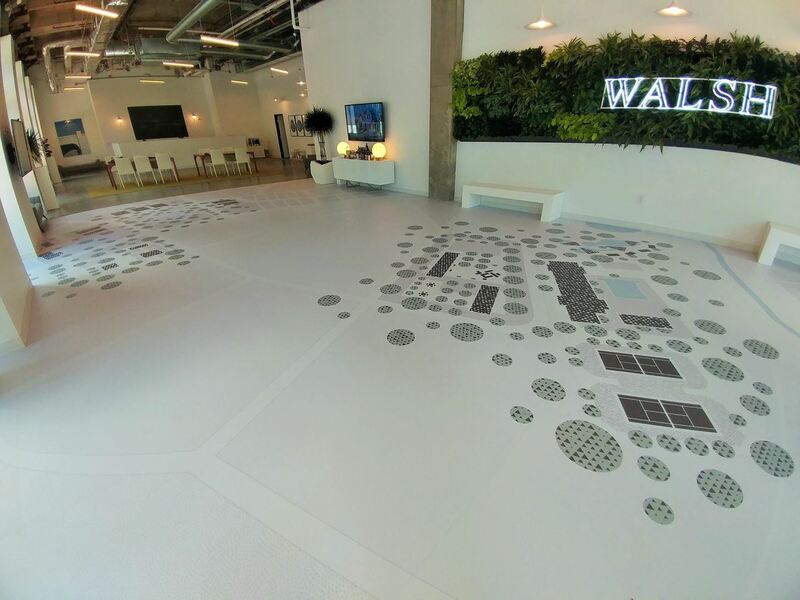 “We definitely see a wow factor from prospective residents when they come to our pop-up sales center to learn more about Walsh and are literally able to tour the neighborhood using augmented reality and our floor maps. As community developers, we’re always looking for new and innovative ways to build a stronger connection with future residents, and I think that the people interested in Walsh are truly excited by the fact that we are trying new and forward-thinking ways to build that relationship,” said Tony Ruggeri, co-CEO at Republic Property Group. I had the opportunity to view the experience in person. Afterward, I spoke with Voll and Anthony DeBono, principal at d3 Creative Studio, about how they pulled this experience together. During the planning phase, Frog, the technology solutions provider who will manage the fiber network and one-day open office space in Walsh, held a two-day immersive whiteboarding session with the development team and other stakeholders. It was during these sessions that the idea to use augmented reality as a means to enhance the sales experience came to light. “What we were looking to do, specifically in the pop-up and storefront that was there, was to be able to deliver an immersive experience to potential residents or people looking to learn more about Walsh before the physical space was actually ready and built,” said Michael Voll at Frog. After reviewing a number of AR vendors, Republic selected d3 Creative Studio, who Voll was familiar with through another project. Launched in Sept. 2015, d3 Creative already had an existing platform aimed towards the architecture, construction and real estate industries. Based on feedback from clients over the past few years, they have polished their Inspir3D app, available on iOS and Android. “We were very happy to find Anthony and his team at d3 Creative and some of the work that they were doing because it followed the same vision of how we saw things getting implemented, and it was really implementing it flawlessly so that it integrates. The user experience is perfect is simple and intuitive, and it doesn’t feel gimmicky,” said Voll. The map, which measures 26 by 43 feet, is the largest marker that d3 Creative has ever worked with. Previously, the largest markers they have produced were 36 by 48 inches or the size of plotter paper. In addition to size, d3 Creative had to contend with a number of challenges with regards to the leasing space. Lighting was a concern, with large, open windows letting in natural light, tall surrounding buildings laying shadows during certain times of the day, and reflection of light off of various surfaces. The material for the printed map also had to be durable, as visitors would be walking over it daily. To ensure that the experience would be friendly to visitors, d3 Creative prepared test demos printed in actual size to see how people would navigate around the models, with particular attention paid to the angles and the heights at which they would look the map. The interactive experience is built in Unity and Vuforia based off of architectural and engineering plans, which are enhanced digitally with vegetation and other environmental imagery. In order to display such a large area, DeBono and his team pre-rendered the models to consolidate file size into smaller packages which can be downloaded quickly from the cloud as needed. Optimizing content was key. It’s one thing to do a piece of furniture or a single-family home, but then when you talk about doing an entire community and doing the amenities there and then adding all the vegetation and trees, and making it look good, it really pushed us. We learned a lot along the way, which we’ll implement into future projects. So, it was all good; it was a win-win for us and for RPG. Pre-rendering also reduces the processing burden on the display device, since it isn’t having to render shadows, textures or polygons. This approach also allows d3 Creative to launch multiple projects using the same app without having to issue an update to the App Store. More importantly, it also provides for a smooth experience, where visuals appear as soon as the marker is recognized by the app. 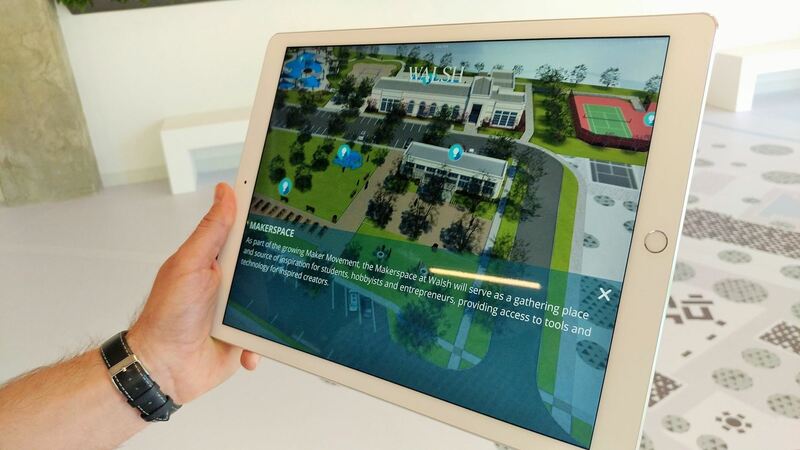 For this project, the iPad Pro was chosen to display the AR site plan because it had the biggest screen, the most memory, and best CPU of available the iPad family to enable a smooth experience on a high-quality display. While the app is available on the App Store, Republic preferred to have customers come into the retail space, where their representatives, armed with an iPad Pro, are trained to walk through the app. Moreover, Republic and Frog preferred a mobile AR experience versus a headset to keep the experience simple and avoid intimidating prospective customers, many of whom had never seen AR content before. “We do feel, and have plans that in the next generation of showcasing this technology and the new feature sets that we’re adding, we’re going to add more immersive experiences and things like the HoloLens, but first we wanted to get the general audience and viewers comfortable with seeing it and understanding it in an interface that is simple and intuitive. And then, once they get comfortable with that, people can start wrapping their heads around putting on a headset and viewing it that way,” said Voll. Looking forward, d3 Creative’s preference for and experience of developing in Apple’s ecosystem is about to pay dividends with the announcement of ARKit, particularly with its ability to enable markerless AR for iOS apps. Since it will work with existing hardware in millions of iOS devices (compared to Google’s Tango platform, which requires a special array of sensors), DeBono expects to see a large spike in adoption once iOS 11 goes live. They are already working on migrating the Inspir3D app to ARKit in preparation for a fall release alongside iOS 11. “It’s evolving so fast, and we’re very excited about where it’s going. It kind of breathed a little bit of new life into AR and the whole push with Apple’s announcement,” said DeBono.